BOSTON, Mass. – For the first 13 games of the season, Canton senior Ryan Nolte and junior Johnny Hagan took turns punishing teams as members of different lines. For the last 13 games, the duo reunited on the Bulldogs’ top line, ramping up Canton’s already potent offense. 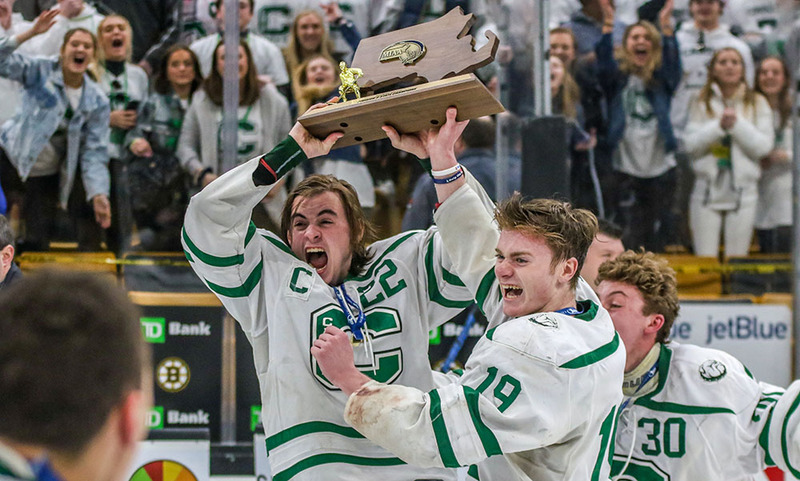 And in the biggest game of the season, the Division 2 State Championship against North sectional champion Tewksbury, Nolte and Hagan — along with linemate Timmy Kelleher — delivered when it mattered most. Nolte and Hagan played on the same line for nearly the entire 2017-2018 season, helping the Bulldogs win another Davenport division title and reach the D2 South Semifinal. This season, Shuman decided to split the dynamic duo to begin the year, putting them on separate lines. Click here for a photo gallery from the D2 State Final. After tying for a team-high 36 points a year prior, splitting Nolte and Hagan gave Shuman an elite player on each of his first two lines, and also allowed Hagan to play his natural position of center. “The best part about them, when I talked to them about splitting them they might have been unhappy but they didn’t show it,” Shuman said. “They just went out and had an outstanding first half of the season. That just shows the kind of leaders that they are. I know a lot of high school kids that would pout and sulk and let it affect their game, but not those two. They are just two special players, as good as they are individually, they are two great team players. While Nolte and Hagan admitted they weren’t thrilled to part ways, neither let it show in their performance and helped the Bulldogs raced out to a perfect 13-0, outscoring opponents 64-13 in that span. Plus, it wasn’t an entire split as the pair played together on the power play and penalty kill. So after three straight close games — a win over Newburyport, a third-period rally to stun Franklin, and a close win over North that included a late game-winner — along with the emergence of junior center Tommy Ghostlaw, Shuman elected to reunite Hagan and Nolte with Kelleher on the first line. The result was four straight comfortable wins, outscoring opponents 24-1 in that stretch. And in one of the most challenging games of the year, Nolte and Hagan each scored in a 4-3 decision over D3 powerhouse Hanover. A week later, Hagan provided the heroics by scoring a goal regulation to salvage a tie with Boston late and keep the Bulldogs unbeaten. The junior then scored in overtime to help Canton advance to the final of the Quinn Memorial tournament. Ghostlaw’s strong play allowed Shuman to keep Nolte and Hagan together on the top line. Ghostlaw (13 points) clicked with linemates Chris Lavoie (27 points) and Shane Marshall (15 points), giving the Bulldogs a strong second unit. When the playoffs rolled around, Canton’s top line took its game to another level. In an opening-round rout of Medway, Nolte scored twice while Hagan and Kelleher each scored once in a 6-0 victory. Again Oliver Ames, Nolte scored the game-winning goal midway through the second period by tipping in a shot from Jack Connolly. Kelleher buried an empty net goal to seal a win over the Tigers, arguably the toughest opponent the Bulldogs played this postseason. In the semifinals, Nolte recorded a hat trick, two of which were assisted by Hagan. And Hagan also scored once, set up by Nolte, as the Bulldogs ran away with a 6-1 decision over Norwood. The offensive onslaught continued in the South Final as the Bulldogs’ top line was responsible for half of Canton’s eight goals. Kelleher scored twice while Hagan and Nolte both found the back of the net once while registering two assists apiece. Under the lights at the TD Garden, Canton’s first line shined the brightest. That line was on the ice for all six of the Bulldogs’ goals, scoring five of them. Kelleher opened the scoring, tucking in the rebound off a shot from Owen Lehane with Nolte getting an assist with 9:04 left in the opening period. Minutes later, Connolly blasted a low shot from the right point to make it 2-0 with 7:27 to go in the first. It took just 16 seconds for Canton to add to its lead as Nolte muscled his way into the slot and buried a wrist shot to make it 3-0. The cohesion between Nolte and Hagan was on full display for the next two goals. The first, Hagan interrupted a pass near the blue while Tewksbury was on the power play. He went into the offensive zone and had his shot saved, but Nolte won the battle behind the net and found Hagan in front for a one-timer and a 4-0 lead. Of Canton’s 29 playoff goals, the top line of Nolte-Hagan-Kelleher scored 19 of them. The Redmen cut it to 4-2 with two straight tallies over the second and third periods, but Nolte and Hagan responded with a power-play goal. Nolte won a battle along the side boards, skated towards goal and slid a pass to Hagan right in front for a score. Hagan completed the hat trick with an empty net goal, assisted, of course, by Nolte. While Nolte and Hagan didn’t start the season playing on the same line, they finished it together as state champions.